kind of a long way round... but so is C.
Construction on the field is only just beginning, so Z may be crucial in avoiding all of that. ...not to mention as a way of accessing the new de-icing pads (shown outlined in dots on the far west/central part of the field on the new FAA diagram). Yes, I believe the plan for 27R arrivals will be to use Zulu to Kilo or Lima, where you will merge with 28C arrivals and head into the concentric rings as one line of arriving aircraft. Zulu has no intesections or sharp turns, which will result in faster taxiing and no brake burnout (the major problem with the current setup). There is also no HS zone due to 27L departures on Zulu as there is on Tango. The path for 9L arrivals is less clear, ideally, they would build a full parallel taxiway back to Zulu from the exit lanes for 9L rather than having to follow Mike/Mike2 back to Charlie and then back to Zulu. This cleans up the traffic flow as it makes the flow from 27R/9L the same no matter which direction the field is flowing. One odd thing I observe is that often GA traffic is assigned to the 10s/28s. 27L/9R is used 95% of the time for GA arrivals, but for GA departures it's a lot more scattershot. In theory they could handle everything on 27L/9R. Perhaps they don't want the hassle of jamming in a departure (especially a slow piston engine) on the North runway in the middle of a constant stream of RJ's and small narrowbodies and its easier to send them across the airport where there are multiple departure runway options. Are the LAHSO on 28/10Cs so that 10R and 28L traffic can taxi around the ends of them? Does traffic landing on 28L go to the end of the runway or take the high speed taxi, cross over 28C and taxi up P to GG and cross 28R? Another snippet of information I came across. Sounds like 9C-27C is scheduled for a November 2020 commissioning, and the de-icing pad should be ready to go for this winter season. Yes, the LAHSO near the end of 28C is so that traffic taxiing from 10R/28L can taxi across 28C/10C without stopping on Zulu and Golf Golf. Papa flows west when landing on the 28's and is only used for arrivals off of 28C. Some nice wallpapers for one's computer. Wish all major airports do this. So a pilot touching down on 28C will see an aircraft taxiing across his or her runway at the far end..........................Interesting. Very efficient and safe use of parallel runways. One of the reasons ORD is fascinating to watch, it is indeed a ballet. I do not understand why DFW does not use a similar taxi operation to cut down on landing aircraft having to wait to cross an active runway. Yes, and also remember that in contaminated runway or reduced visibility you can't do LAHSO, so in those situations, traffic coming off of 28L will have to Hold Short 28C and wait for clearance. And as far as that additional hotel at the CONRAC facility, that was news to me & I wonder if this is this is still the case? 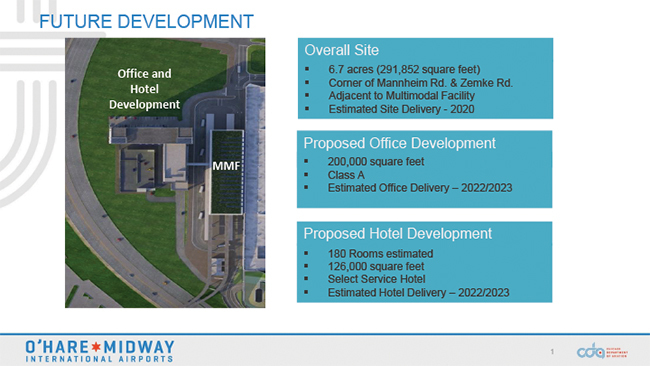 "The other [hotel] would have 150 to 200 rooms and be part of a new mixed-used commercial development on O'Hare's northeast side along Mannheim Road, north of Irving Park." ...but I haven't seen any sign of it on Google maps satellite view - perhaps its still pending or has been dropped; just curious. You know, I overlooked that hotel as well, but sure enough, it's actually in the CDA illustration you noted too. The weird thing is though, I'm not sure the rendering is quite accurate about the location. IIRC correctly, there's kind of a large ditch (drainage pond?) in that area in front of the CONRAC right now. Not sure if it's temporary for construction or what. But if I had to guess, I'd echo what United787 says below: it's likely to be closer to the Zemke & Mannheim intersection. At least, that would be more logical than having a Northbound Mannheim-only entrance right in front of the CONRAC. Overall, I'm a little skeptical on the hotel piece(s) of the O'hare 21 plan...seems like that will be the last part to come to fruition, if ever. The Crain's article seems pretty sloppy also. In their illustration they circle a new building (assuming hotel) at the CONRAC facility but their description of it's location is way off. Although technically on Mannheim and north of Irving Park, the CONRAC site is 2.5 miles north of Irving Park. Would make more sense to say Mannheim and Zemke or even Mannheim just south of Higgins. Are they planning a hotel near the ends of the 10/23 runways or do they just have horrible geography? FWIW, buried in the Future Developments section of the RFP for that (tiny) concessions facility is the most detailed picture I've seen of what CDA proposes to do outside the facility. So it seems a number of projects just west of the CONRAC and the ATS terminal in the works, including office space-that's news. Thanks for digging into that. Hopefully the hotel project is several stories high: should have great views of the field and arrivals on 27L/28C. What's with BA294 (B-747) this evening - anyone know? Returning to ORD after an hour towards LHR. BA297 (A-380) is making its way in on its regularly scheduled flight as well. Lots of British metal inbound! According to the twitter account @ORDairportinsider, BA294 on 9/12 had a nose gear problem: it did not retract fully. What's interesting is that he notes that plane-spotters all over the Chicagoland area noticed it and rang it in. Good to know more than a few folks besides us regulars on here are watching the skies above northern Illinois! You're right, that's the most detailed photo I've seen as well. Good find! And thanks for sharing. There's still plenty of land closer to Zemke according that rendering, so there is room for more office space or another hotel. Will be interesting to see how this project moves forward. But I'm curious what they mean by estimated site delivery 2020 for the overall site? Agree that is should be relatively easy, but not necessary fast. I imagine the city will auction off this development as well - how long that process takes is anyone's guess, but their timeline of 2022/2023 seems believeable to me. The usual suspects, yes, but also some int'l submissions. No pics yet. Frontier Airlines added Chicago MDW back to their Route map. Been Rumored a ULCC was coming (back) to MDW. 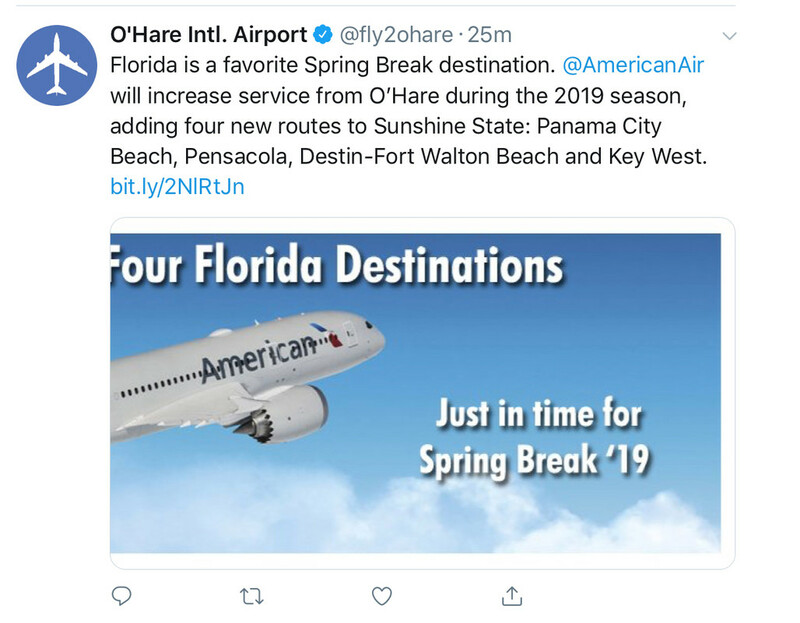 Speculation has been Allegiant Air but the way Frontier has been expanding doubling down on Chicago by adding MDW back might be a great opportunity. I can definitely see a mixture of Florida and non daily international markets. Calatrava always creates a splash but, as the article relates, is also now known as someone who runs over budget: "The Zurich-based firm of Santiago Calatrava, whose projects include an airport in Bilbao, Spain, and the over-budget World Trade Center transportation center in New York." They also mention the Chicago Spire, another project of his which is now more famous as a hole in the ground. I would think he has a hard row to hoe in Chicago. "Also in the running are the firms of innovative Danish architect Bjarke Ingels and American architect Curtis Fentress, who designed the fabric-roofed Denver International Airport. They join big Chicago firms — Skidmore, Owings & Merrill; Perkins+Will; Jahn; and Epstein — that lead other teams competing for the project." In their favor, F9 has much more name recognition in the Chicago area than it used to, that's for sure. Wouldn't surprise me, FWIW. I have yet to see a Cadillac Escalade on the tarmac, but if I do I'll now know why: AA is offering Concierge Key members transfers gate to gate when facing difficult connections. 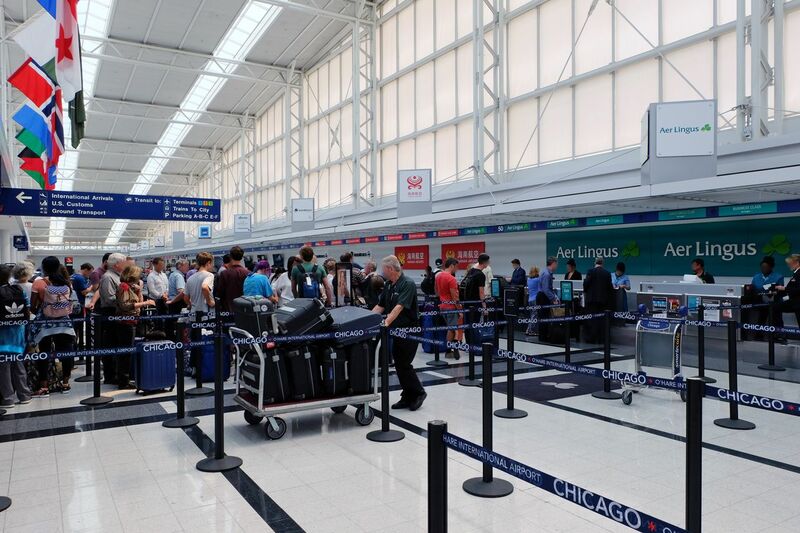 "As a new perk for Concierge Key travelers at ORD... American's customer service agents monitor flight data at O'Hare, looking for Concierge Key flyers who are facing tight connections, and will send a car to meet them when their aircraft arrives. American already offers the Cadillac transfers at its Dallas/Ft. Worth, Los Angeles, Charlotte, Philadelphia and New York JFK hubs." If I'm not mistaken, United offers, in some situations, Mercedes-Benz transfers for international first class travelers? or is it Global Service members? Ah.. so that was what was happening - thanks ORDfan for picking that up! ...shows some interesting changes from the last, including a new taxiway Z the entire length of the field on the west side. Also, 10C/28C lost one foot in length from 10,801 to 10,800 feet. Looking at their route map. It looks like they also include Volaris routes. I wonder if MDW is on the map since Y4 is there. But it appears F9 does not codeshare on the Y4 flights into MDW. Would be a smart move by F9 to return to MDW and capture more of the Chicago market. This is an impressive list: Studio Fuksas, wow!? I love their airport designs - they are truly avante-garde starchictects. HOK and Gensler do okay work, but nothing earth-shattering like Fuksas or Calatrava, not to mention SOM, Perkins, etc. I don't think ORD can lose with this roster. As I noted earlier, I love what Perkins+Will did with T5 to this day, but I am really excited to see what Calatrava and Fuksas come up with: I think those might be my new favorite horses. 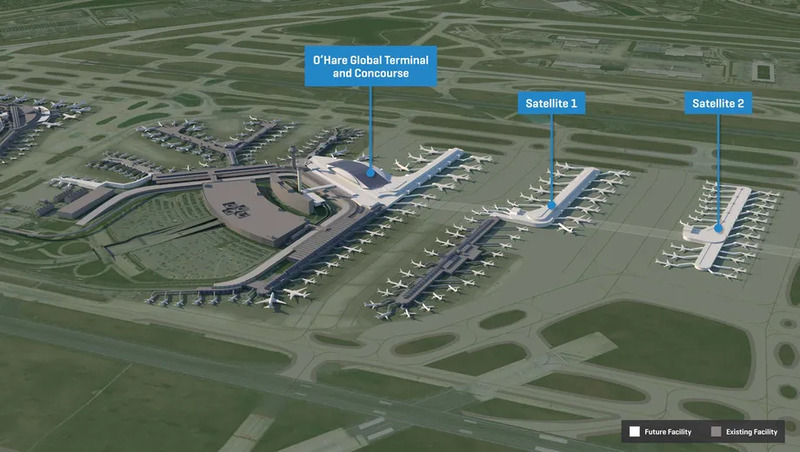 However, I'm not sure about the Global Terminal and satellite terminals being 2 different architects. I was hoping to see some conformity between the designs, which I guess is still possible, but not in the sense as if all 3 were done under one house. Perhaps, the top two finishers will need to cooperate once selected? Calatrava excels at public works projects: museums, libraries, terminals/transportation spaces , etc. The Spire was a private development, and yes I agree, I have heard about budget concerns with him in the past, but that doesn't stymy public projects the way it does private ones. If he creates something world-class, I don't think the Spire deal will matter one bit. He recently unveiled a giant public sculpture for River Point tower in perhaps one of the most prominent spots on the river, and he has the bone-fides to be a serious contender. I'm looking forward to this race. Yesterday, I dropped off a relative at T5. I parked the car and walked across the bridge to the terminal, and I noticed something that I hadn't seen before: the board at the entrance of the bridge, with the airlines list servicing T5, noted that Lufthansa LH 437 to Munich departs from T5, unlike the other LH flights, which of course depart from T1. From what friends who fly to Europe and Asia regularly say, Terminal 5 stopped being functional about 10 years ago. It is too small for the number of flights that it handles, especially during the rush period when flights start arriving from Europe. There needs to be more room for people going through security, as well as people in the immigration and customs areas, as well as extending the east end of the concourse. Is there a way to do it while leaving the grand space in the ticketing area? Probably. But, the priority needs to be on getting people from the curb to the gate, and getting people off the plane and to the curb with as little hassle as possible. By the same token, I remember when there was no parking garage in front of Terminals 1, 2, and 3. It was just a vast surface lot in front of the three terminals, which were the epitome of the International Style, three austere glass boxes. Was it a grand vista for anyone walking from a parked car to any of the three terminals? Of course. It was the same for anyone driving to the terminals, as they passed the exit road into the parking lot. But, when the number of people driving to ORD and needing to park exceeded the number of spaces, the garage became the necessary evil. The garage is the primary view when driving in on I-190. You really only see Terminal 1 from the north end. I once read that Man builds monuments to himself, and those monuments have included cathedrals, palaces, train stations, bank buildings, court houses and other government buildings, department stores, downtown skyscrapers, and airport terminals. In the 21st Century, a lot of people don't really care about architecture. It's simply getting from A to B with as little hassle as possible, and that the space isn't too hot in the summer and too cold in the winter. I think a lot of people still care about architecture. They may claim they don’t, but I would bet anything that when they experience some jaw-dropping architecture, they are just in awe of it as anyone else. Architecture is half the reason we travel, it is a part of each culture. If there was no interesting or unique architecture/food/etc., why travel? I think MDW has been listed on their route map as a Volaris destination for years now, so it's not new. I can't find anything anywhere saying they're returning to MDW. Anyone have more info? I don't see them returning since they switched over to ORD. F9 never flew anything but DEN from MDW, ORD is where all their expansion took place. Both F9 and Y4 just started their codeshare last month. MDW made its way back to their route map when the codeshare started. Frontier flew to other destinations besides DEN out of MDW. Before the move to ORD they had ILM, TYS, and TTN. In Enrilia's post this week he notes that United plans a considerable increase in ORD-ANC seats next Spring. *UA ANC-ORD MAY 1.0>3[1.0] JUN 1.0>3[1.8]"
ANC-ORD flights are all redeyes, and all leave within a short time frame (earliest departure at 19:55 and the latest 20:40) and all arriving at O'Hare in the 04:00-06:00 range. Again, United daily on all flights but with Alaska offering no returns to O'Hare on Sun/Tues/Wed and doubling up on Sat. In Enrilia's post some expressed skepticism that UA will actually implement all these flights and some suggesting it as a move to keep American from entering the race.... don't know about that but I thought it was interesting. Have to give ORD props for this: nice little feather in the cap, I'd say. Also 2nd most connected international airport, after only LHR. 17 new international routes launched or announced last year?!? That's more than I thought..! As much as I still like T5, I can see your point, and their points of view on this. This past weekend, I kinda thought T5 was looking a little worse for the wear as well, per-security of course. With so many flights now, there a lot more bodies snaking through check-in lines, and around 3:00pm, it was so crowded around the restaurant and help desk area in the middle of the terminal, you could barely move. There was a bona fide human traffic jam. Some of the support columns and white surface areas could definitely use some paint and touching up - I don't recall T5 looking so "scuffed up" in recent memory as I saw on Sunday. It was a busy summer, of course.... But still, the CDA needs to pay attention to appearances and up-keep. I'm guessing this permanent now? Unfortunately? There's just too many different airlines needing the space and the wall decorations made the space less flexible. Also, with Delta moving in it will all have to be reshuffled and will be in a consistent state of shuffle as Star and OneWorld carriers move out as the new central FIS opens, and subsequently other T3 carriers like Jetblue and Spirit likely move in. I imagine that when the dust settles, carriers with multiple departures through the course of the day (DL, B6, NK, F9, AM, maybe 4O) will have their own backdrops while the other airlines using T5 will stick with the monitors. The architecture of T5's exterior is grand and beautiful. There is something really special about driving up to the departures level at night and seeing that beautifully lit up building. I'm completely against a new hotel blocking that view. I love the classic style of permanent billboards behind dedicated check in desks. Unfortunately there are way more airlines at T5 now and it didn't make sense to have desks blocked off for one airline that only has a daily flight or in some cases less than a daily flight. The monitors are pretty standard now at most international airports globally, so we'll see less and less of the billboards behind check in desks over the years. Terminal 5 is overcrowded. I'm happy they remodeled the concessions but the security line is a big problem, and a worse customer experience now. In the evening Europe/Middle East bank it can take almost an hour to clear security, no exaggeration.I hope that when they extend the M concourse further east they break open a new security area on the far side of the check in hall (where the TK check in area was- not sure whats there now), so gates M12/13 and above would have a separate security line to go through. Obviously, the arrivals hall is going to need a big renovation as well, with DL moving their operations there as well as other non-aligned carriers, there is going to need to be more than one domestic baggage carousel. I think the hotel has a chance to enhance the site - a vertical paired with the existing horizontal T-5. Hopefully its not too massive. It's the garage I'm worried about. With the north and south ATC Towers in operation what or who is occupying the "newer" tower in the between T2 and T3? Is snow desk still using the tower by the Hilton? So when its not winter its empty? Do both towers in the terminal complex get torn down when T2 is redone? The "newer" tower is still the main tower for ATC at ORD. The North & South towers, as I understand it, only control the far north and far south runways and adjoining taxiways respectively. And yes, the CDA snow patrol is still in the original tower by the Hilton. And also, fun fact... The original Chicago TRACON was located under ground, beneath the original ORD control tower before it was turned into a Mega TRACON out in Elgin. It's hard to believe ORD was once an up/down facility at one point. With 37 airlines using T5 for departures, there was realization that the ticketing area had to go common use. As part of the new U&LA agreement it happened. Same with the bag makeup areas. There's common use counters in T2. The next phase is changing the static signage curb side with dynamic signage to match up with the check in zones. The "common use" counters in T2 are just the vacant former US, CO, and B6 counters - AFAIK DL uses the same counterspace that NW had always used and AC's counterspace hasn't changed in decades either. What other airlines operated out of T2 in the past 20 years? HP? TW? I’d be interested to know the reason for this too. LH have had a net decrease in aircraft movements since they pulled DUS-ORD so they must be getting a raw deal from UA if it’s a gate space issue at T1. Yep, I thought so...still bummed! I totally agree... I hate the idea of blocking the view to T5. I'm not a fan of the hotel or parking garage idea... if it doesn't come to fruition, I won't mind at all. You're right: T5 is at its busiest ever... I kinda thought that was the case. I'm not that old (in my early 30s), but its weird how even I feel nostalgic about those old airline logo billboards....I remember them throughout my childhood, and I noticed that they were missing. The departure hall feels a little different now. But yes, you are right: they are becoming standard the world over... I am lamenting the "flat-panelization' of everything.... ugh sigh. Hmm, interesting. I wonder if it's a recent issue? LH 431 is still T1, so it must be a really specific time slot (5-6pm?). Anyway, I'm glad to see another T5 departure. I haven't been a fan of LH's T1 late evening departures, LH 433 or LH 435... and I've noticed LH 431 and 437 sell out sooner than the 433 or 435. Those get in so late that they force you to miss the morning connections in FRA and MUC. Here's a more in-depth article about the architects submitting proposals for O'hare 21. The Trib failed to report all these names: some of them are really rock-star firms, wow! Bjarke Ingels Studio Gang, and Curtis Fentress too...just keeps better for this project. Thanks for that - We are really going to have a lot to talk about in the next few years. Still no fan of Calatrava - sorry -the bleached bone carcasses now leave me cold, but this roster of competitors I'm sure will not disappoint. Speaking of the arts... Have not been impressed with Lufty's new scheme, but I have to admit here on it's cargo affiliate MD-11F (landing at O'Hare a couple of weeks ago) their livery looks pretty impressive; I must be coming around to it. Does anyone forsee AA temporarily moving to satellite 1 and 2 and razing T3 and building something new. It's really the only time AA could do it and maintain ops. They couldn't without putting the Global Terminal & concourse on hold. UA needs S2 for UAX in order to close T2. Well, this might actually have some fruit. In the O’hare 21 plan or whatever it was called, the end result (So once all the piers are open, 3 & 4) did show that the main hall of T3 would be widened and left in place, but without the pier concourses. So maybe, in the future AAL will occupy S3 & S4. I can only imagine then that the widened T3 hall will become an extension to the Global Terminal. I understand that the current piers will probably need to go, as they’re not conducive to widebodies, but I find it hard to imagine they wouldn’t have at least 1 big wide body pier. Makes you wonder if all that ramp space will be hardstands while the widened T3 hall has gates? If so, that would be quite disappointing to me. Saw this while going through twitter today! New routes are always welcome! In the O’hare 21 plan or whatever it was called, the end result (So once all the piers are open, 3 & 4) did show that the main hall of T3 would be widened and left in place, but without the pier concourses. So maybe, in the future AAL will occupy S3 & S4. I can only imagine then that the widened T3 hall will become an extension to the Global Terminal. I understand that the current piers will probably need to go, as they’re not conducive to widebodies, but I find it hard to imagine they wouldn’t have at least 1 big wide body pier. Makes you wonder if all that ramp space will be hardstands while the widened T3 hall has gates? If so, that would be quite disappointing to me. You'll see minor revisions of T-3 in the 10 year plan, but major redevelopment of T-3 in the 30. AA is also not clearly as invested in short term growth at ORD, especially as compared to UA. Maybe in the long term that would change, so a later redevelopment of T3 for them would make sense. It's going to be incredibly outdated 30 years from now though- its already a bit dated with the narrow concourses. Depending on growth, though, isn't AA's choice somewhat limited, since they don't get the APM into T3 without rebuilding it (obviously)? So if traffic gets to 101.5 mil and triggers Sats 3 & 4 and the APM, I wonder what would happen; AA isn't signed to anything beyond Phase I, and the T3 redevelopment is Phase II and clearly up to AA and the city (as T1 is with United and the city). OTOH, maybe I shouldn't be asking long-term questions regarding AA, period.